The racing industry reacted quickly to the death of Barbaro with the creation of the Barbaro Memorial Fund, an initiative to raise money for research into laminitis and other equine health and safety issues. The National Thoroughbred Racing Association will lead the drive and organize fundraisers at major races, including the Triple Crown events — the Kentucky Derby, Preakness and Belmont Stakes. In addition, the NTRA will use merchandise sales and television time to support the effort. Barbaro's owners, Roy and Gretchen Jackson, welcomed the announcement. "Gretchen and I hope Barbaro's memory can be carried on through advances in medical research, including a cure for laminitis," Roy Jackson said Thursday in a statement released by the NTRA. Barbaro, the 2006 Kentucky Derby winner, was euthanized Monday after complications from catastrophic injuries in last May's Preakness Stakes. 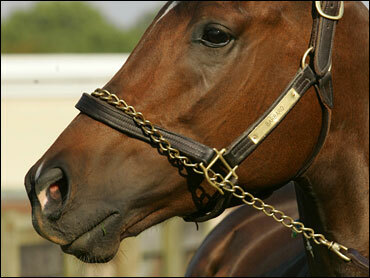 Barbaro developed deadly laminitis, caused by uneven weight distribution in the limbs, in his left rear leg in July. In his final days, the disease struck his front feet. Raising money for laminitis research will be a specific target. "The outpouring of emotion and support from racing fans has been so amazing that we wanted to find a fitting way for those fans and our industry to honor Barbaro," NTRA chief executive Alex Waldrop said. "We anticipate a busy few months as we work together to assist projects that can have a great impact on the health and safety of thoroughbreds and, through our focus on laminitis, horses of other breeds as well." The funds raised will go into existing equine health charities such as the Laminitis Fund, established by the University of Pennsylvania and the Grayson-Jockey Club Research Foundation.